Good morning and welcome to your Friday the 13th! I think black cats are beautiful and I have never yet found them to be bad luck…just another case of animals getting a bad rap!! Even though I haven’t been blogging often, I have been trying to get on here on Thursdays to honor Vegan (Feast) Thursday, but yesterday was a busy day and so here it is Friday. I have to say that I am so happy about the amount of people that have been telling me they are trying to eat plant-based diets as well as asking questions about recipes, different foods, etc. This makes me happy because it’s always a win-win-win situation for the people, the animals and the environment! While there are TONS of great vegan cookbooks (and I do think I have them ALL!) and lots of great info online, I have to say that I have really been enjoying, and highly recommend, the book Jolene sent me during the holidays. It is called VEGAN’S DAILY COMPANION by Collen Patrick-Goudreau and I recommend this highly. If a plant-based diet and lifestyle is new to you, or if you have been living the compassionate life forever, this book will still be of great interest. It is chock full of great stories about people and animals, recipes, perspectives and so much more. 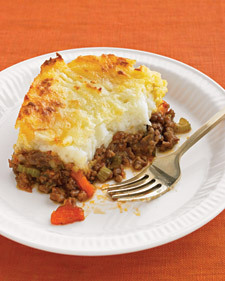 I haven’t made Shepherd’s pie since the feast days, but with St. Patty’s day approaching, it’s a perfect one, so I am reposting: It looks like a lot of work, but it’s not at all difficult–just need a little time, but can prepare in advance………. Saute the onions and carrots in oil for 5-7 minutes, or until onions soften. Add the garlic and cook 2 more minutes. Add all remaining ingredients and simmer 10 minutes adding more broth as needed to allow cooking time. Boil the potatoes with the salt and cook about 20 minutes or until fork tender. Drain well, mash and fold in butter. Add soy milk as needed to create a firm, yet creamy texture. Season to taste with salt and pepper. Place all the beef mixture in a 1 and 1/2 quart casserole dish (I use a large meatloaf/bread pan). Top with all the potatoes. Place small dollops of butter evenly across the top of the casserole. Sprinkle paprika over top and bake for 20-25 minutes until slightly browned on top and well heated through. I put the oven on broil for the last 5 minutes and it really made for a beautiful presentation. Sprinkle with herbs to garnish and serve immediately. This recipe makes about 5 servings. Have a great Friday and remember, if you are lucky enough to see a black cat today, it’s all good!!! Previous Previous post: RIP Sam Simon, Writer, Director, Producer and HERO! Next Next post: Could Be Us!?!? !